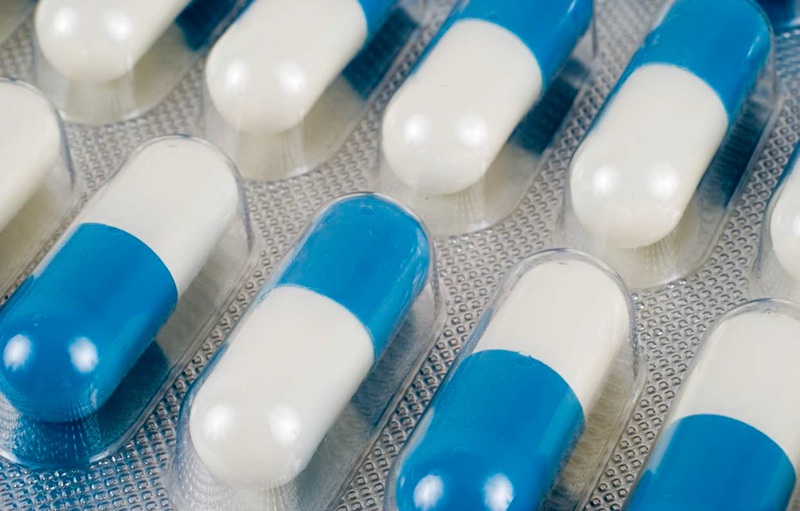 Selectivity is a traditional criterion in choosing lead compounds as it helps to avoid potential side effects. However, most traditional drugs act on more than one target, exhibiting a complex, multifaceted pharmacological profile. Their therapeutic action in several cases is probably explained by this polypharmacological behavior. To facilitate comparisons of bioactivity data from different publications and assay types, all the data points in Reaxys Medicinal Chemistry have pX values. These are normalized values assigned to the data to enable straightforward quantification of compound–target affinity, regardless of the origin of the data. Taking advantage of the vast amount of experimental data already extracted, structured and available in the Reaxys Medicinal Chemistry database, in silico profiling of a classical medicinal chemistry scaffold was performed to assess the polypharmacology of phenothiazine. Phenothiazines are very simple substructures. They were among the first dopamine D2 antagonist structures to be discovered. Historically, this scaffold has been used for various therapeutic applications, in particular as an antischizophrenic. A substructure search for phenothiazine (Figure 1) in Reaxys Medicinal Chemistry retrieved 22,266 compounds with the phenothiazine ring scaffold. These 22,266 compounds are involved in 33,152 reactions, have 32,614 bioactivities associated with them, show activity against 942 targets and were extracted from 7,914 citations. To facilitate comparisons of bioactivity data from different publications and assay types, all the data points in Reaxys Medicinal Chemistry have pX values. They are calculated by transforming EC50, IC50, Ki, etc. into pEC50 = -LogEC50, pIC50= -LogIC50, pKi = -LogKi, etc. These are normalized values assigned to the data to enable straightforward quantification of compound–target affinity regardless of the origin of the data. 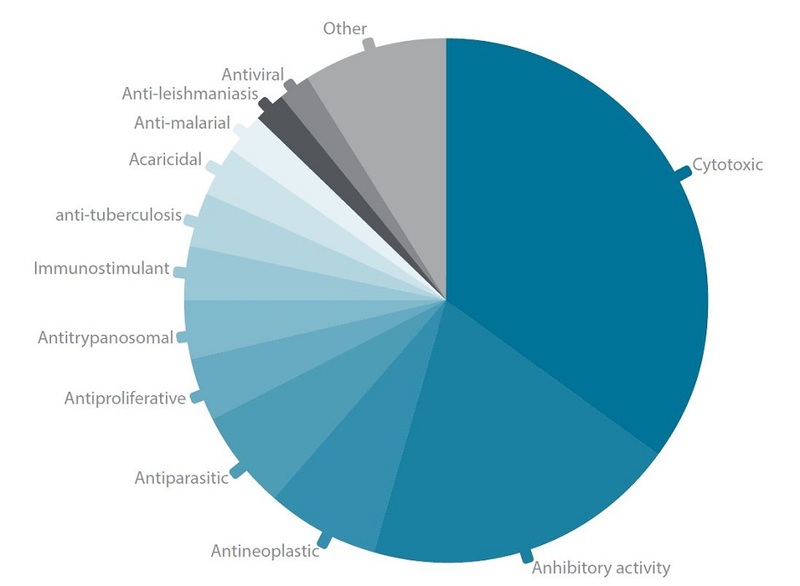 The activity profile for all phenothiazines found in Reaxys Medicinal Chemistry can be viewed in the Heatmap (Figure 2). 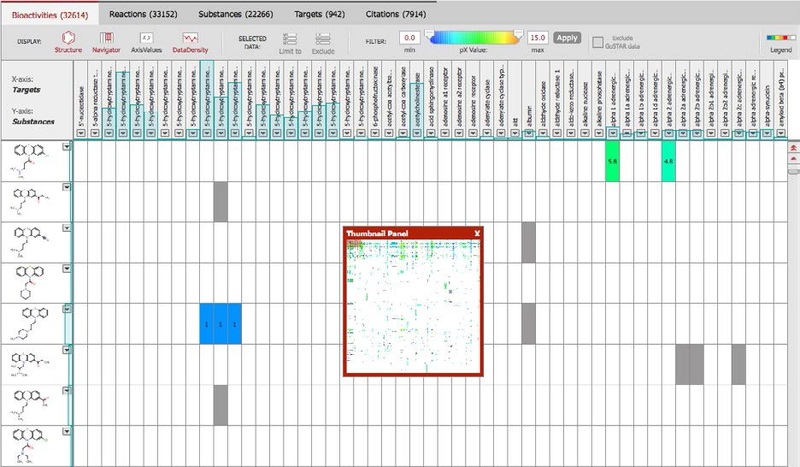 This visualizes the relationships between compounds and their targets in terms of key parameters, allowing rapid identification of relevant compound– target interactions. Figure 2. Affinity/activity Heatmap obtained for the 22,266 phenothiazines present in the Reaxys Medicinal Chemistry database. In the Heatmap, biological affinities or activities are quantified with the aforementioned pX values which range from 1, indicating low activity and displayed in blue, to 15, indicating high available; white cells indicate a lack of data. The Heatmap displays all the phenothiazines for which in vitro biological data has been mined from the literature and the target proteins associated with them. 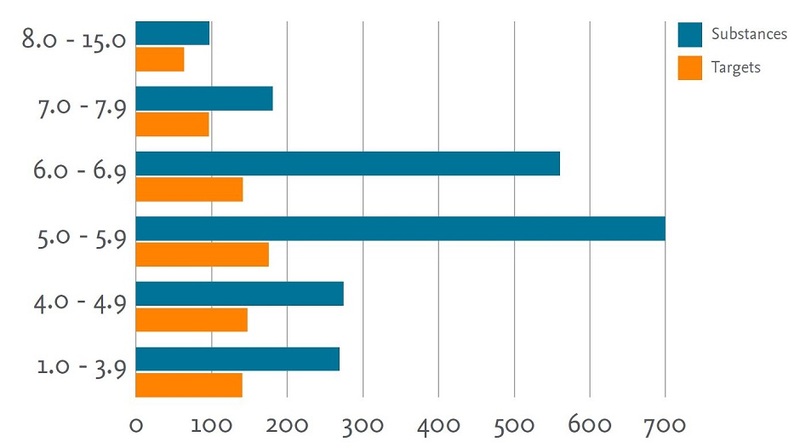 In this case, there are 2,074 phenothiazine substances active against 474 targets. 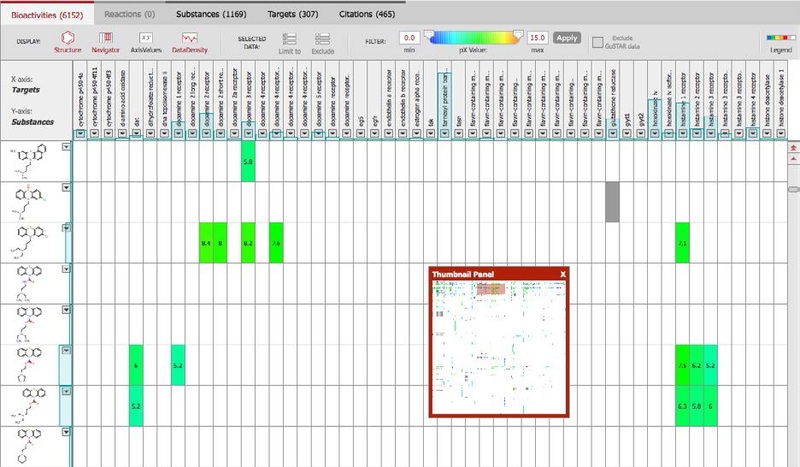 The thumbnail provides an overview of the entire Heatmap with a panel highlighting the section of the map currently displayed on your screen and the data density display showing the number of molecules retrieved per target. A similar Heatmap could be produced for the most potent substances having a pX value of 5.0 (10 mM) in light green to 15.0 (1 fM, most active) in red (Figure 3). There were 1,174 substances with a pX above 5.0 and they were were active against 250 targets. Figure 3. (A) Heatmap for the phenothiazines with pX value (activity) above 5.0. (B) The Heatmap was sorted by activity against 5-HT2a with the compound highlighted having a pX=9.6 (0.25 nM). 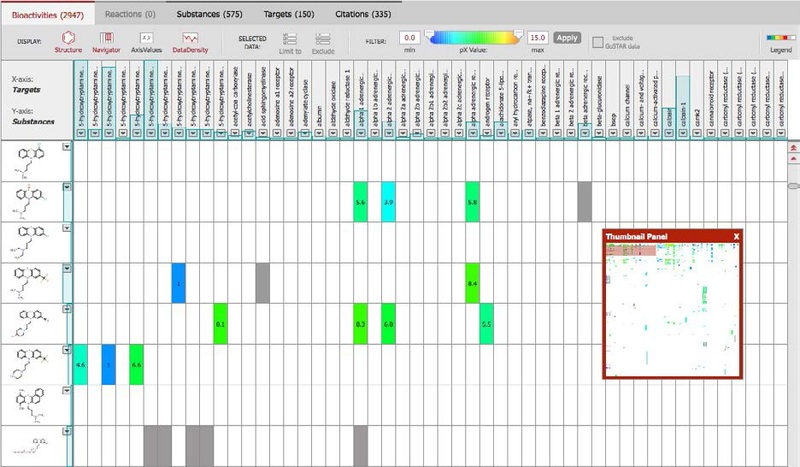 A multitude of key parameters can be explored to aid understanding of the compound–target interactions, such as the bioassay types, species, therapeutic effects, biological parameters measured and cell lines. 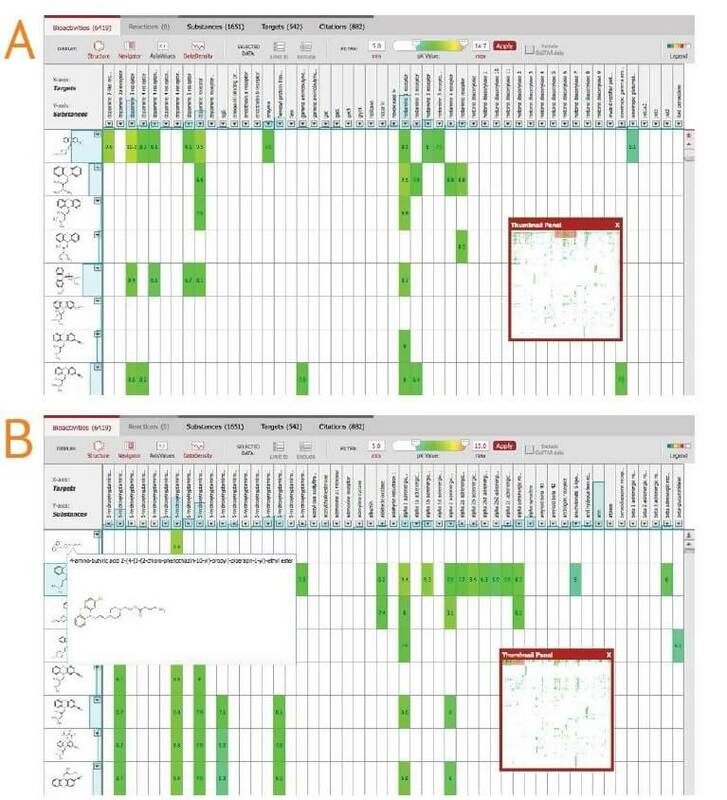 For example, using the side filters, a detailed study can be done using the Heatmap to distinguish binding profiles for human (Figure 4) and rat (Figure 5). Figure 4. Profiles were restricted to human binding profile data. Figure 5. Profiles were restricted to rat binding profile data. The following analysis shows how the number of phenothiazole ring structures and biological targets with quantitative bioactivity data varies depending on the pX activity threshold (Figure 6). Most of the phenothiazines with bioactivity data have a pX value between 5.0 and 5.9. These compounds show activity against 175 targets. Figure 6. 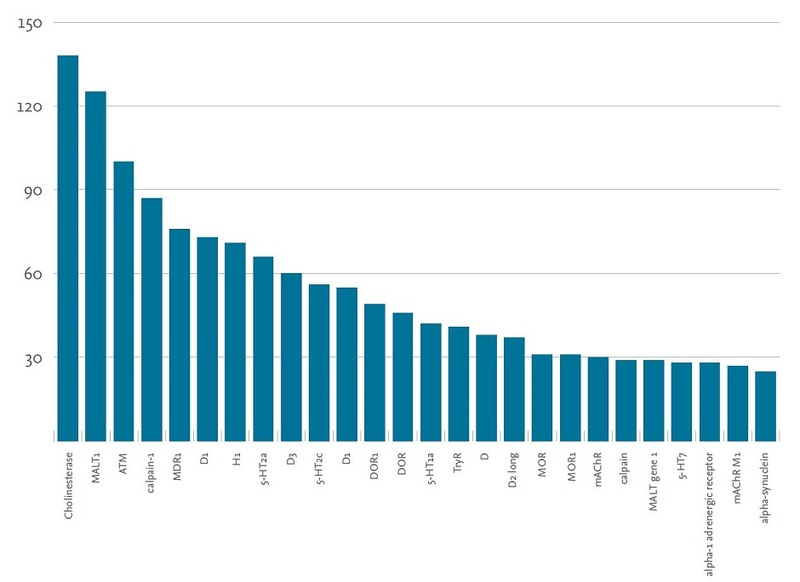 Analysis of how the number of phenothiazine structures and associated biological targets varies with the pX value ranges (y axis) selected using the Heatmap. Examining the data further we can see that 1,174 compounds have biological activity against 250 targets with pX values above 5.0 (Figure 7). Activity against targets such as ataxia telangiectasia mutated protein (ATM), which is a key kinase involved in the DNA damage response-signaling pathway, could provide a new avenue for anticancer research using phenothiazines as the scaffold. Figure 7. Analysis showing the number of phenothiazine structures with activity corresponding to a pX value of 5.0 or higher against each target. Only targets with over 25 substrates are shown. Extracting data from the Heatmap enables the exploration of the therapeutic effect of phenothiazine compounds with a pX value higher than 5.0 (Figure 8). 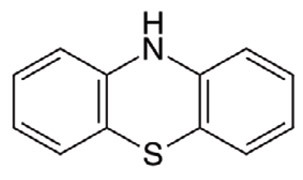 Phenothiazine scaffolds could have potential as cytotoxic and antineoplastic agents. Figure 8. Analysis showing the reported therapeutic effects observed with the most active phenothiazine structures (compounds with a pX of above 5.0). This study demonstrates that in silico profiling using Reaxys Medicinal Chemistry is an efficient and rapid method to assess the polypharmacology of compounds, as shown here with the example of phenothiazine compounds. This method could be used to investigate the mechanism of action or act as a starting point for research into new indications for a compound. Reaxys Medicinal Chemistry empowers hit identification and lead optimization with normalized compound–target affinity data and comprehensive pharmacokinetic, efficacy, toxicity, safety and metabolic profiles.